Volunteerism is a mainstay at NJIT, with students and faculty engaged in a range of initiatives to better the community. Such efforts, amounting to more than 59,000 hours of community service over the past year alone, have been recognized both nationally and locally. The university has made the President’s Higher Education Community Service Honor Roll, “one of the highest recognitions a university can receive for its commitment to volunteering, service-learning and civic engagement,” six times. And just recently, NJIT received another nod with a Commerce and Industry Association of New Jersey “Champion of Good Works” Award for Volunteerism. 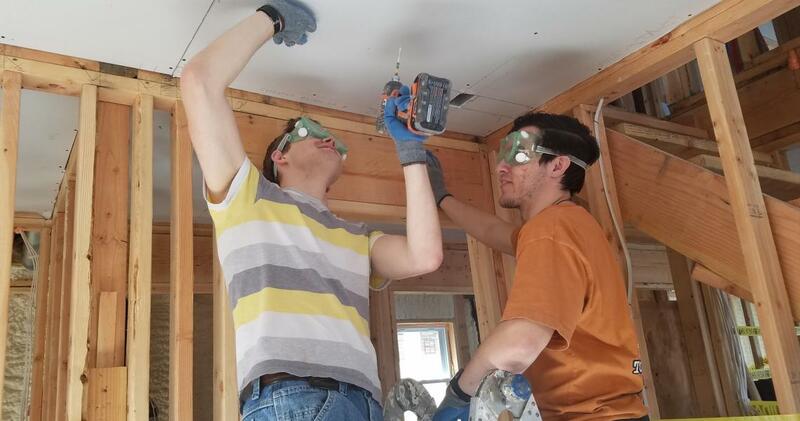 The honor acknowledges the university’s Alternative Spring Break (ASB) program, created in 2013 to assist in the ongoing cleanup and rebuilding after Superstorm Sandy. Coordinated by Career Development Services, NJIT’s central location for community service, ASB has since expanded to connect students with a variety of neighborhoods in need. As part of this year’s National Volunteer Week (April 15-21), for example, NJIT will partner with William Paterson University to complete a beautification project started during ASB 2018 at the Bessie Mae Women and Family Health Center in East Orange, N.J. Students will finish painting the center in preparation for its grand opening next month. To mark this year's celebration of giving back, we've rounded up some of the past year's stories that spotlight the university community's many service contributions and achievements. Coaches and members of the NJIT men’s soccer team partnered with a group called Be The Change to provide meal bags for the homeless and organize donations for victims of fire and other tragedies. Facts and figures, along with personal reflections from students, demonstrate the impact of NJIT volunteerism. School of Art + Design student Jihad Peoples ventured half a world away to the Greater Accra Region of Ghana, where he tilled soil, mixed concrete and sweated bullets in 100-degree weather. Ying Wu College of Computing’s Osama Eljabiri was awarded a 2017 New Jersey State Governor’s Jefferson Award for his tireless efforts to engage thousands of New Jersey middle school and high school students in STEM. Nearly 1,000 freshmen participated in NJIT’s annual First-Year Day of Service, sweeping cobwebs from cultural landmarks, harvesting herbs and vegetables from urban gardens, and more.